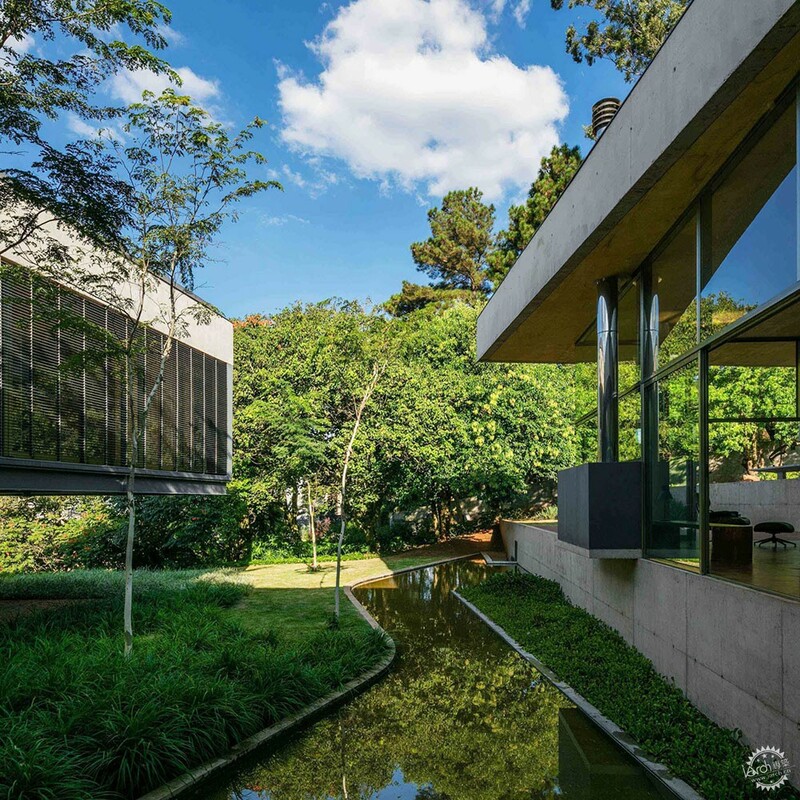 A ramped walkway and staircases lead like a "continuous drawing" through the stepped levels of this concrete house in Brazil, designed by Una Arquitetos, to end at a lush garden on its roof. 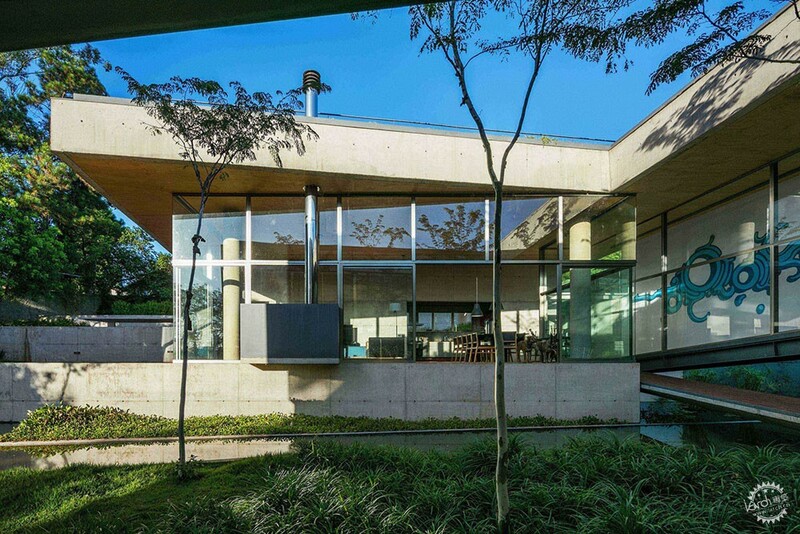 Casa em Cotia, or House in Cotia, is a family residence named after the São Paulo municipality where it is located. 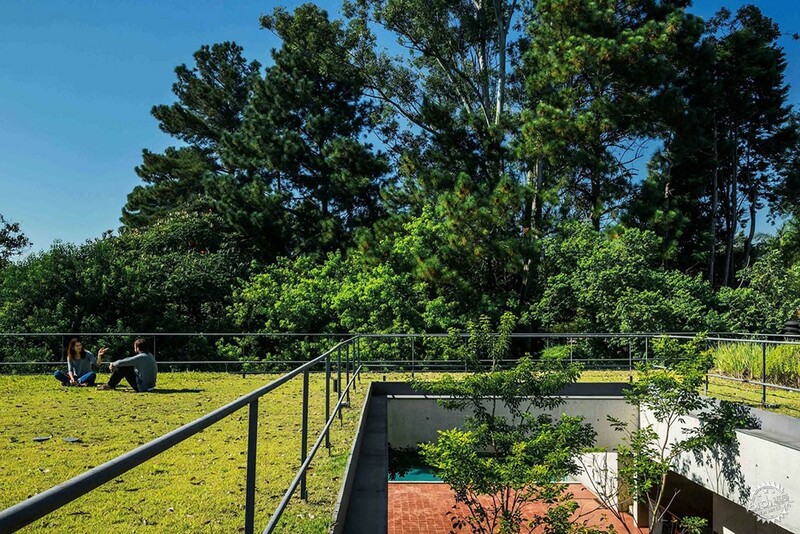 Locally based Una Arquitetos completed the property for a vast 2,600-square-metre clearing near a forest, giving the team plenty of freedom with the design. 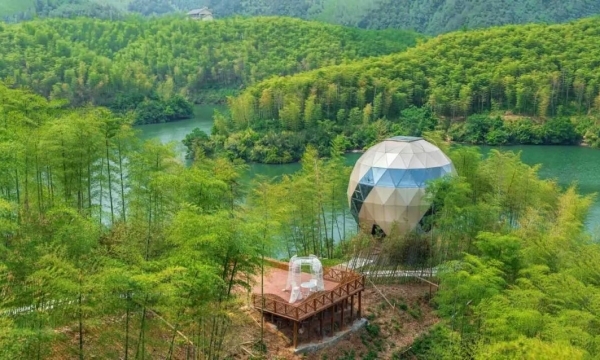 The main challenge was to accommodate the site's slope, which the studio says is a typical feature of the area. In response, the practice separated the 730-square-metre home into three concrete blocks set at different levels across the site. 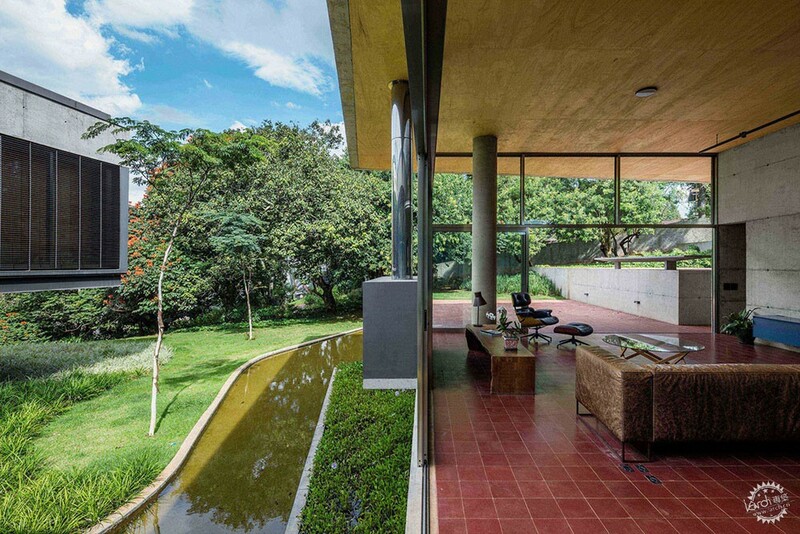 Large windows, columns and overhanging volumes are all reminiscent of Brazilian modernism – the style adapted for the region by architects like Lucio Costa and Oscar Niemeyer during the early-to-mid 20th century. 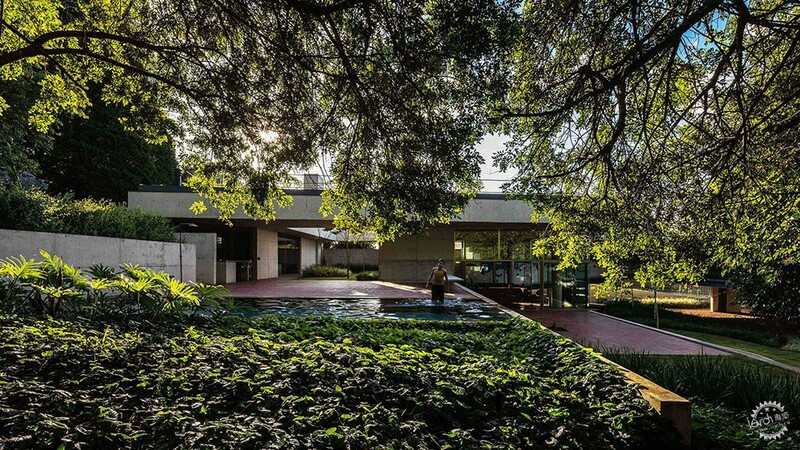 A 45-metre-long roof placed on top of the blocks acts a unifying element, with its grassy and sandy covering matching the tones of the woodland surrounding. Two large holes puncture the roof, above courtyards that bring natural light into the four levels of the house. A series of ramps and stairs are used to connect each floor. 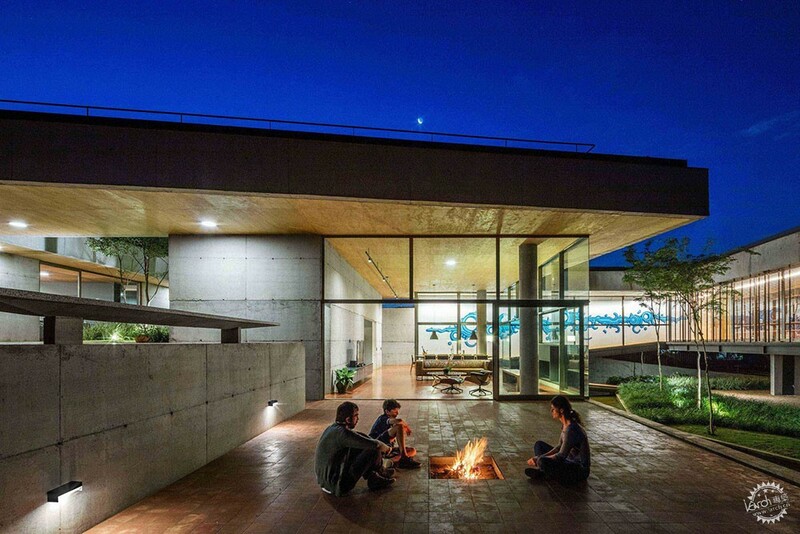 "Designing a house always presumes a commitment to sheltering family relationships," said Una Arquitetos in a project description. "Embracing childhood, everyday life, establishing scales of measures to the world." "This one particularly, seeks to reinforce the walking, the promenade, as a way to conceive the place," the studio continued. "Being so, a path is completed as a continuous drawing, connecting all spaces, going up and down the slope, without determining if one is diving or submerging." The ramp begins outside underneath the lowest level, which is raised above the ground to create a sheltered entrance into the house. 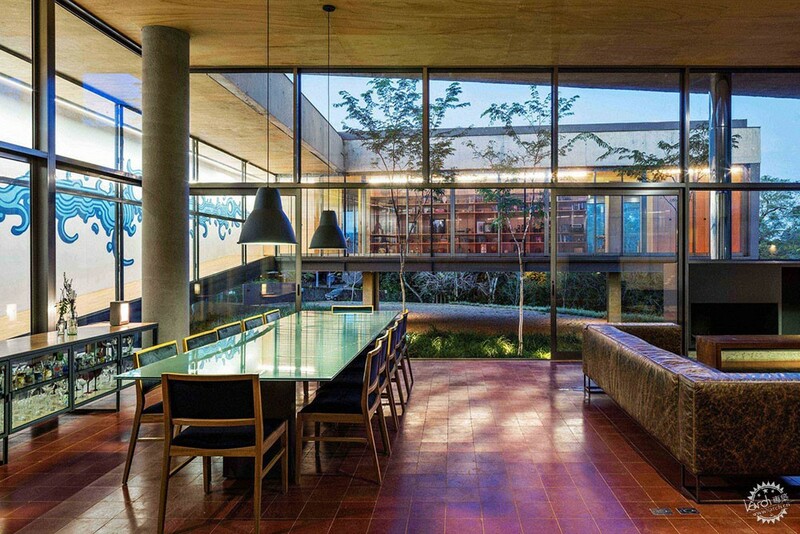 The slope then crosses through the first courtyard, over a snaking pool, into the open-plan living and kitchen. From here, it turns back on itself to lead to the elevated block at the front, where the bedrooms are located. A pair of staircases flanking the kitchen continue the route through the residence. One leads up to a covered outdoor walkway that wraps around the second yard area. Access to the final block, occupied by a living room and a music room, is provided from here. 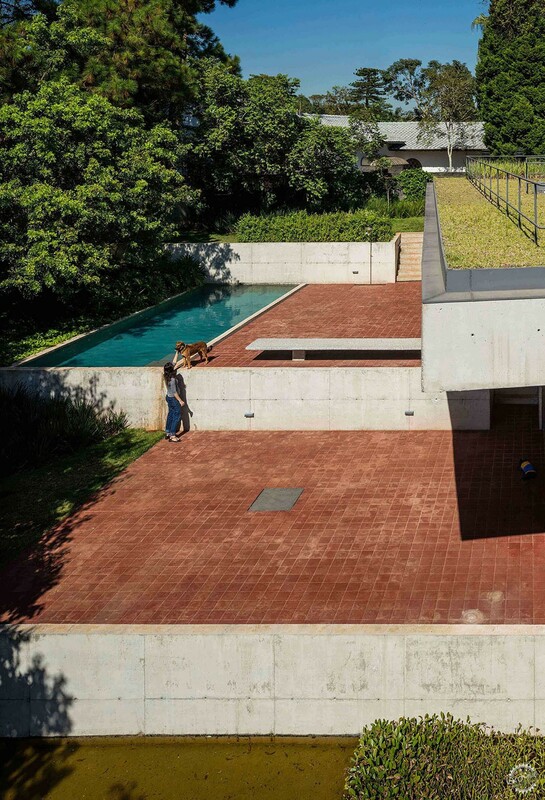 On the other side, the second staircase links to an outdoor patio featuring a swimming pool and a long bench, with vegetation planted beside. The terrace forms the middle platform between a lower level adjoining a garden, and an upper level that provides access to the roof. 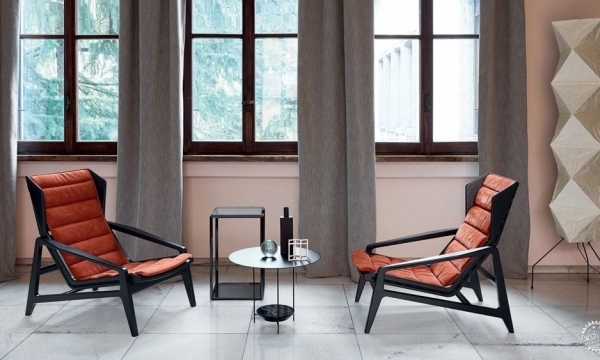 Terracotta-like tiles cover the floors of the outdoor patios and continue inside. 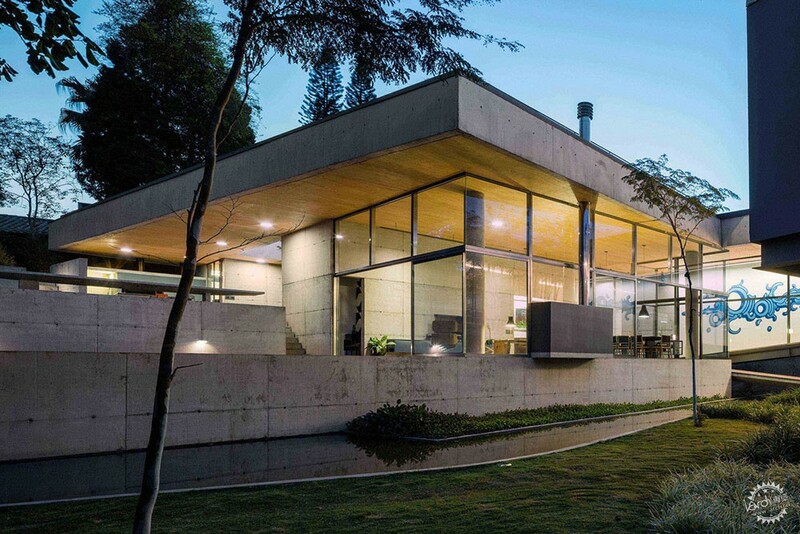 Una Arquitetos used a stripped-back palette for the interior to reflect the modern style of the residence, leaving the concrete walls and wooden ceiling exposed. 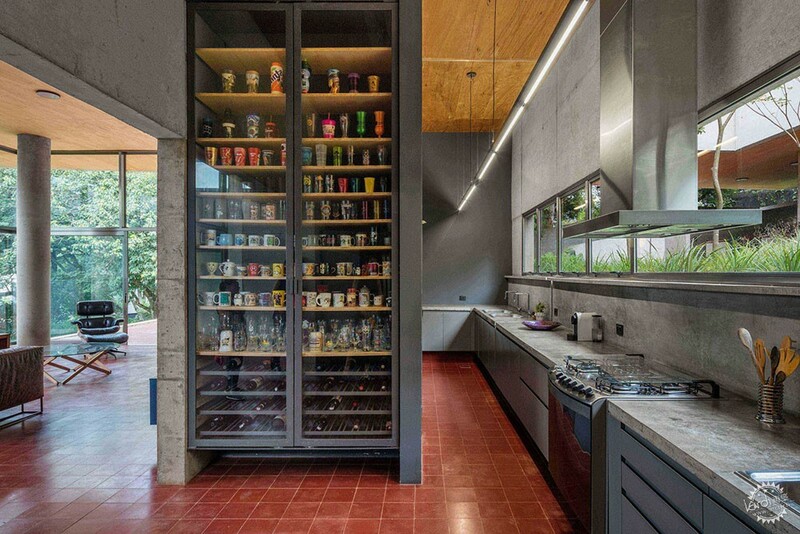 Fittings in the kitchen are concrete, while furnishings in the adjoining lounge and dining room come in dark leather, wood and glass – also reminiscent of the early 20th-century aesthetic. 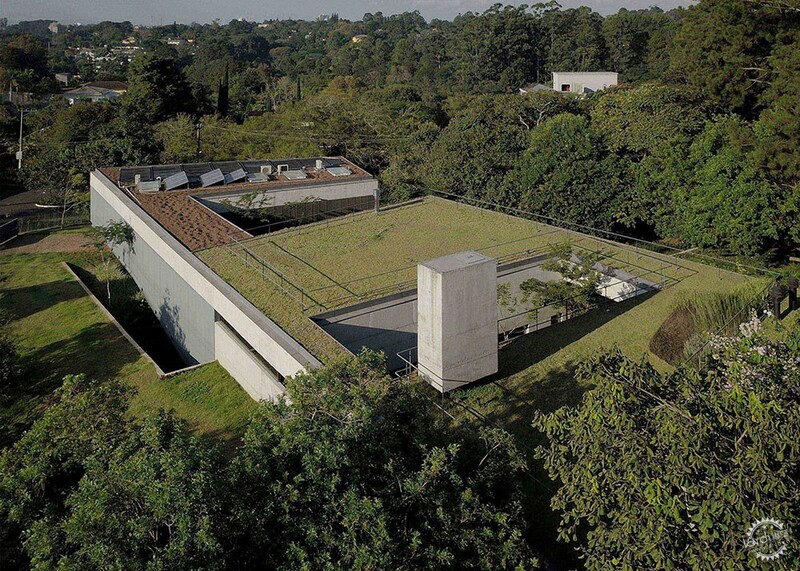 Also in Brazil, architecture firm Studio MK27 completed a concrete house that is similarly topped with a monumental grass roof. Other recently finished residences in the country feature a starkly different material palette, including an all-white house by Bloco Arquitetos and a residence by Vilela Florez covered in chevron-patterned bamboo. Photography is by Nelson Kon. Top photograph is by Bebete Viegas.